We are successfully ranked amongst the topnotch entity offering a wide range of Heat Resistant Conveyor Belt. 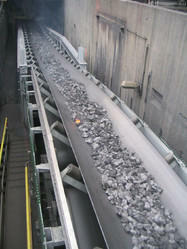 Such belt is used for carrying hot materials over the conveyor. Transporting high temperature materials over the conveyor damages the conveyor belt; hence, installing such heat resistance belt keep the production always up and running. Besides, clients can get the belt from us at industry leading rates. Looking for Heat Resistant Conveyor Belt ?